La Luministe by Paula Butterfield (March 15, 2019 Regal Books) is a lovely new novel about the life and art of Berthe Morisot, a French Impressionist who was able to capture the effect of light and atmosphere perhaps better than any of her contemporaries. They called her La Luministe, a nickname she most certainly earned. This book reads as if you are standing in front of a Berthe Morisot painting, wishing she would speak to you – and then quietly, privately, she does. And not just about her daring brush strokes or her use of quiet color, but also the secrets, the stories and the struggles hidden in each canvas. Yes, you will be fascinated to read about Morisot’s scandalous love triangle with the Manet brothers, but at its heart, this book is about a woman’s greatest passion: her art. I absolutely loved the book and knew I’d found a kindred spirit who was as fascinated with Berthe Morisot as I was. I reached out to Paula Butterfield and she agreed to respond to a few interview questions. I hope you enjoy our chat! As a women’s studies academic for almost twenty years, I saw over and over my students’ stunned reactions when they learned about previously unknown women’s contributions. I feel like when Berthe and Edma saw a Rosa Bonheur painting in person, they would have been tremendously excited and encouraged. Representation is something we consider now, and it would have been equally applicable for young 19th century would-be artists—if a woman could paint a work that earned the Legion of Honor, maybe they could, too! Also, I wanted to illustrate the bond between Berthe and Edma. They were sisters only a year apart in age, but they were also each other’s only artistic colleagues, since girls were not permitted to attend art school or to socialize with artists. I was always forming clubs with my sister and my friends as a kid, so I guess it was only natural that I’d form a club for these two artistic sisters. 2. Which Berthe Morisot painting is your personal favorite and why? (Okay, that’s impossible, so give me your top 3.) Have you had the chance to see them in person, and if so, how did that affect your novel? I’ve seen lots of Berthe’s paintings, in Paris, Washington D.C., Philadelphia, Chicago, San Francisco, and more places I can’t remember. And you’re right; there’s no way to choose one favorite. For my top three, I suppose I’ll choose Summer, the painting in which Berthe came closest to achieving her goal of making a figure dissolve into the atmosphere. I’m compelled to add a painting of Berthe’s daughter, Julie, the light of her life and her favorite model. To me, this study for a painting of Berthe and Julie (tellingly, never completed) says everything about being an artist-mother. Sometimes, if you want to get anything done with your little anchor following you around, you have to integrate your child in your work! And finally, I have to include one of Berthe’s paintings from the post-Impressionist years, when she returned to Renaissance techniques. Jeanne Pontillon, a portrait of Berthe’s niece, uses rich hues and long brushstrokes. 4. I myself have wondered for years whether Berthe and Edouard Manet were in fact lovers. When there is no concrete proof and letters have been destroyed, it’s hard to know for sure. What tipped the scale for you? No, there is no concrete proof that Berthe and Edouard were lovers. And Berthe’s biographers have varying opinions. For me, Edouard’s portraits of Berthe tell the tale. For one thing, he painted more portraits of her than of any other model, and he never parted with any of them. One of Berthe’s biographers, Margaret Shennan, refers to the relationship between Berthe and Edouard as “a dialogue of two intelligences.” They were of the same social class, so it was possible for them to get to know each other in the first place. The two met their intellectual and artistic matches in one another. And just look at the paintings, which range from flirtatious to downright steamy. Can anyone look at Reclining and tell me that Berthe and Edouard were not lovers? 5. I never before understood what an enormous impact the Franco-Prussian War had on the Morisot family and particularly Berthe’s health. What sources did you rely on to dig into that period in the Passy neighborhood? Do you think her health issues from the war contributed to her early death? Every book I read about Berthe or Edouard discussed the war. The Judgment of Paris: The Revolutionary Decade That Gave the World Impressionism, by Ross King, and The Greater Journey: Americans in Paris, by David McCullough are two non-academic books that offer harrowing descriptions of Paris during war and its aftermath. Most definitely, the deprivations Berthe suffered during the siege of the Franco-Prussian War left her lungs permanently weakened. She suffered from bronchitis every winter for the rest of her life, and when she contracted pneumonia during the winter of 1894, that illness was too much for Berthe to withstand. I am surprised to learn how many men of this time period were afflicted with syphilis. In the novel, Berthe learns about Edouard Manet’s disease and says: “my sympathy for him transformed into utter rage that he would let his taste for women lead to the destruction of his genius.” How did you decide you had to address this issue? It wasn’t a decision; I wasn’t going to dissemble about the cause of Edouard’s death. But I made the effort to put it in context to emphasize the dark side of the City of Light. Even Berthe, who lived a sheltered life, knew that one in five Parisian men suffered from syphilis. And I also make a point of Berthe’s awareness of prostitution and illegitimate children. She was conscious of the light and shadow in life and was contemptuous of the enormous hypocrisy displayed by Parisian society. Later, that same contempt spilled over into her opinion of the ossified art establishment. That rebellious attitude shaped what was a radical life: she loved whom she chose to love, and she painted in the style she wished to paint. Tell me what made you want to write a book about Berthe. What was it in her artistic struggle that captured your imagination the most? What spoke to me personally about Berthe’s story was what I think of as the prison of her privilege. While no women were permitted to attend l’Ecole des Beaux Arts, the prestigious state school that trained, exhibited, and provided patrons for its students, there were some art schools open to working class women. Rosa Bonheur, the artist Berthe and Edma idolized, ran such a school herself. But it was deemed unseemly for upper-class girls to attend a school that prepared students to earn their livings as artists. Girls like Berthe did not pursue professions or enter the commercial world to any degree. I’ve often wondered how life might have been different if Berthe had attended a women’s art school. She would have had many more artistic colleagues, to fall back on when Edma gave up painting. And with more artists with whom she could exchange ideas, Berthe might have developed her own style earlier in life, saving herself years of paralyzing self-doubt. Author Paula Butterfield taught courses about women artists for twenty years before turning to writing about them. La Luministe, her debut novel, earned the Best Historical Fiction Chanticleer Award. Paula lives with her husband and daughter in Portland and on the Oregon coast. Berthe Morisot was a fist in a velvet glove. In 19th century Paris, an haute-bourgeois woman was expected to be discreet to the point of near-invisibility. But Berthe, forbidden to enter L’École des Beaux Arts, started the Impressionist movement that broke open the walls of the art establishment. And, unable to marry the love of her life, Édouard Manet, she married his brother. 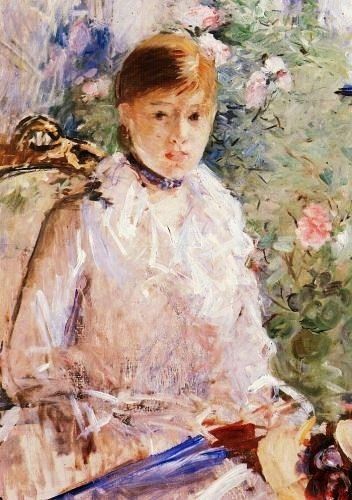 While she epitomized femininity and decorum, Morisot was a quiet revolutionary. Anna Ancher (1859-1935) is a hugely popular artist within Denmark, but she and her paintings are much lesser known beyond Scandinavia. Thankfully that is beginning to change. The National Museum of Women in the Arts in Washington, D.C. hosted an exhibit in 2013 called A World Apart: Anna Ancher and the Skagen Art Colony, bringing a comprehensive collection of Anna Ancher’s work to the United States for the first time. I first encountered her art more recently, when I saw two of her paintings in a traveling exhibit sponsored by the American Federation of the Arts entitled Women Artists in Paris 1850-1900 (previously written about here). As wonderful as those two exhibits were, it is a rare event to witness Anna Ancher’s work outside of Denmark. Anna Ancher, The Harvesters (1902), one of Anna Ancher’s paintings that traveled to the Women Artists in Paris 1850-1900 exhibit in the U.S.
Anna Ancher deserves wider recognition because her work in oil and pastel is truly remarkable. Given the fact that she was born and raised in a small village at the northernmost tip of Denmark and received little formal training, her understanding of form, color, light and shadow is exceptional. She deserves to be ranked among the best 19th century artists, including Degas, Cassatt and Morisot. In addition to her surprising talent, her story is inspiring and instructional for anyone interested in the gender struggle of women artists in the late 19th century. While American and French women artists fought to be taken seriously during this time period, Anna Ancher received great encouragement and recognition from her family, fellow artists and the official art world in Denmark. She didn’t have to forsake marriage and family for her career. According to our 21st century vocabulary, here was a woman who seems to have had it all. So what was her secret? What was the difference? My curiosity took me all the way to Copenhagen. The Hirschsprung Collection in Copenhagen hosted a 2018-19 exhibition called Michael Ancher and the Women of Skagen. At the same time, the museum hosted an exhibit called the Allure of Color: Pastels from Anna Archer to P.S. Kroyer. What an opportunity to get acquainted with this exceptional woman. Anna Ancher, (sounds like “anchor” in Danish) née Brøndum, was born in Skagen, a small little fishing village on the northernmost point of Denmark. Her parents ran an inn, where she was lucky to meet visiting artists who came to paint the raw coastal scenery in the summer. Inspired by these visiting artists, she began to draw at an early age. The painter Michael Ancher arrived in Skagen the summer of 1874, when Anna was 16 years old and he was 10 years her senior. Michael had received academic art training at the Royal Danish Academy of Fine Arts in the 1870s, and was drawn to the seaside to capture large-scale scenes of fisherman and their nets. The village became widely known in artist circles when Michael exhibited in Copenhagen. The next summer Michael Ancher was joined by his artist friends Karl Madsen and Viggo Johansen. The artists stayed at the Brøndum family inn and they encouraged Anna to take professional training to develop her talents. Anna’s mother, Ane Møller Brøndum, was a strong intellectual woman who ruled the family inn while pursuing an independent study of literature and history. Although she joined a very strict evangelical religion, she still allowed her daughters to pursue an education and associate with the visiting artists who were considered radicals. As progressive as Denmark is supposed to have been, women were still not allowed to attend the Royal Danish Academy of Art until 1888. So instead, Anna’s parents sent her to Vilhelm Kyhn’s private art school for women (Tegneskolen til Kvinder) in Copenhagen. Vilhelm Kyhn was a highly talented landscape painter in the naturalist tradition. He had been trained at the Royal Academy, but after a series of quarrelsome spats with the Danish art establishment, he broke off and started an alternative studio for other dissatisfied artists, including women. Thus, Anna received traditional instruction in painting and drawing, with an emphasis on the Golden Age of Danish painting (1800-1850). Luckily, her training was more rigorous than one would expect from a women’s art school at the time. Anna spent three winters studying in Copenhagen, with summers in Skagen. The visiting artists continued to gather at her parents’ inn in the summer, where she must have benefited from their advice, demonstrations and no doubt some of their casual artistic banter. Anna and Michael Ancher developed a romance and announced their engagement in 1877. Perhaps her parents insisted on a delayed wedding date, or perhaps the pair just didn’t feel as if they had enough financial security to tie the knot at the time. When Michael achieved a significant degree of artistic success in 1881, they married. During their long engagement, Anna and Michael welcomed new international artists to Skagen, including Karl Madsen, who had studied in France and Germany. Anna was exposed to new ideas by leading European artists in a relaxed and nurturing setting. Perhaps it also helped Anna to have a fiancée and parents nearby to prevent unwanted attention or gendered ridicule from other male artists. She had allies. Anna’s painting and pastel skills developed quickly, from both her formal education in Copenhagen and the informal lessons in a thriving art colony. In 1880, she made her début as a professional artist in the Charlottenborg Spring Exhibition in Copenhagen. She sold a pastel and received good reviews. The painting below, part of her début exhibit, shows her sophistication and talent at the young age of 20. Anna Archer, An Old Man Whittling Sticks (1880), Skagens Museum, Copenhagen. First exhibited at the Charlottenborn Spring Exhibition in 1880. Anna Archer, A Young Girl, Tine Normand (1880), pastel on paper, private collection. Sold at the 1881 Charlottenborg Spring Exhibit. After Anna married Michael Ancher in 1881, her dedication to art intensified. Michael considered his wife an equal partner and supported her artistic ambitions. Together with her artist husband, Anna had more artistic opportunities than she might have had on her own. In 1882, the couple received government funding to travel to art centers in Berlin, Dresden, Vienna and Munich. Although she may have lived on an isolated tip of Denmark, Anna was able to travel to see major art exhibitions in leading art centers of the world. Anna had two major accomplishments in 1883: first, her painting The Maid in the Kitchen, shown below, an exquisite painting that displays a sophisticated use of color and light, and second, the birth of her daughter Helga, a golden-haired girl who would remain their only child. Michael Ancher’s portrait of Anna while she was pregnant that reveals a deep respect and admiration for his wife. At the time, however, it was controversial. This was considered a pose appropriate only for royalty, and with the dog’s nose so close to her pregnant stomach, it would have been considered immodest. What woman wouldn’t want a husband who values her more than he values tradition and modesty? Anna and Michael Ancher, Judgment of a Day’s Work (1883), Art Museums of Skagen, on deposit from Statens Museum for Kunst (SMK), Denmark. Anna and Michael enjoyed collaborating on their art. So much so that in 1883, they created a joint painting, where each painted the portrait of the other. Quite an amazing project, as I wrote about here. In 1884, Anna, Michael and Helga moved into a small house a few minutes away from her parents’ inn. The Anchers were able to pop down the street to join the Brøndums for dinner, sparing Anna from having to prepare family meals. Anna also enjoyed the double benefit of having her own maid: not only was she spared many domestic and child-rearing chores, she also had an artist’s model at her disposal all day long. That is why The Maid in the Kitchen (above) should be appreciated as a decidedly feminist statement. The artist is behind the easel, and not behind the sink. Even after the birth of their child, Anna continued to travel to European art destinations from Amsterdam to Paris. Perhaps her parents helped out with child care, or perhaps they brought their young daughter along on their travels. In 1889 she and Michael visited Paris for six months, where they both exhibited and won prizes in the Paris World’s Fair. In addition, Anna took instruction from the famous French artist Puvis de Chavannes. In 1891, Anna executed an ambitious work called A Funeral, an impressively large 48′ x 57″ piece, featuring multiple subjects in a serious setting, not unlike a previous work of her husband’s, The Christening. This painting reveals a mastery of color, while at the same time conveying a distinct impression of calm and control. Purchased by the Statens Musem for Kunst in 1891, this painting elevated Anna’s status as an artist even further. 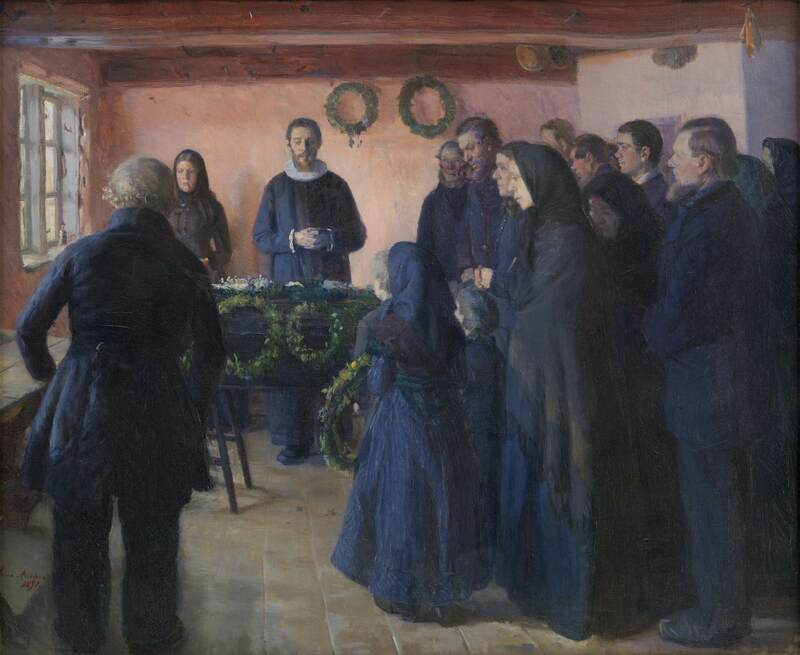 Anna Ancher, A Funeral (1891), Statens Musem for Kunst (SMK), Denmark. Anna often painted their daughter Helga, as well as light-dappled interiors. She was known for her observation of light as it fell across a room, creating patterns of its own. Anna Ancher, Sunlight in the Blue Room (1891), picturing Helga at work on a crochet project. In 1893, Anna’s work was represented in the Chicago World’s Fair. In 1894 she was a member of a committee of Danish women who organized a Women’s Exhibition in Copenhagen. From 1900 on, Anna received many medals and honors, elevating her to a membership in the Royal Danish Academy of Fine Arts. Interestingly, Michael and Anna’s daughter Helga grew up to be an artist as well. She was admitted to the Danish Royal Academy of Art School for Women in 1901, and studied art in Paris in 1909-1910. The pastel below reveals her mother’s strong influence. Michael Ancher died in 1927, Anna in 1935. Their memory lives on at the Skagen Museum, first founded in the dining room of the Brøndum Inn in 1908. Today the museum includes the historic Ancher Hus, the home of Anna, Michael and Helga Ancher. After Helga’s death in 1964, their home was restored and turned into a museum. Such a fascinating woman, especially for her time and place. The fact that she lived in such an isolated and beautiful spot might have actually been the secret to her success. In contrast to many other women artists of the 19th century, who struggled against a family and culture that valued modesty, propriety and conformity, Anna was lucky to grow up in an art colony that encouraged her talent and stoked her ambition. Artistic expression was her birthright. Women Artists in Paris 1850-1900, Laurence Madeline, American Federation of Arts and Yale University Press (2017), catalogue published for the traveling exhibition by the same name organized by the American Federation of Arts. From October, 2017 to September, 2018, The American Federation of Arts gifted us with a traveling exhibit that focused on nothing but women artists who studied or worked in Paris in the second half of the 19th century. It was an astonishing effort that succeeded on all counts. You would think that by now women wouldn’t be as thirsty as we are for a reflection of ourselves in history. After all, we have come so far since the 19th century. However, when the backlash against women feels like it is at an all-time high, when powerful white men refuse to listen to women’s voices, it is more necessary than ever that both women and men see and listen to women from history. Institutional prejudices and limitations on women’s achievements continue to be increasingly challenged, and we have seem female artists conquer, one after another, formerly male-dominated bastions: they are now routinely represented in international contemporary art exhibitions and biennials, and are the beneficiaries of major commissions and sales. Yet we must remain vigilant. Even in the twenty-first century we find art historians who, though they may acknowledge the growing recognition of contemporary women artists, continue to underestimate the importance of women artists during the second half of the nineteenth century, and ignore the ideological conditioning that holds women as secondary to men. Recent gains in women’s participation in the arts now demands an assessment of those who have paved the way – both the women artists who struggled to establish careers in art and the art historians who reinvented the circle language to accommodate them. I saw the exhibit at the Clark Institute of Art in Williamstown, Massachusetts in August, 2018. Due to the complications of modern life, travel schedules and the short period of time the exhibit was up, I went alone. Sometimes that’s good, when friends or family just don’t share your fascination for the art, when they’re more interested in rushing through to lunch than examining each painting’s brushstrokes. But this time, I wish I had gone with a group of women artist friends so we could have connected over how much it meant to us. To be seen, to be honored, and to stand alone with our complicated history. To listen to our own voices without getting drowned out by men. The author in front of a giant life-sized photograph of the women in the 1885 class of Académie Julian. At the entrance to the exhibit at the Clark Institute. Imagine seeing paintings you’ve heard about, read about and studied for years, but have never seen before. By women you deeply admire. It would take years and countless trips all over the western world to track down each of these paintings one at a time. And of course some are in private collections and may never be shown again. The sheer depth of the roster was mind-boggling: from the Americans (Mary Cassatt, Cecilia Beaux, Elizabeth Nourse, Lilla Cabot Perry, Elizabeth Jane Gardner Bouguereau and Anna Klumpke), the French (Berthe Morisot and her sister Marie Edma Morisot Pontillon, Rosa Bonheur, Marie Bracquemond and Eva Gonzales), the Scandinavians (Anna Ancher, Harriet Backer, Mina Carlson-Bremberg, Kitty Kielland, Emma Lowstadt-Chadwick, Asta Norregaard, Hanna Pauli and Ellen Thesleff) and more, such as Marie Bashkirtseff from Russia and Paula Modersohn-Becker from Germany. And then here is a rare treasure by Mary Cassatt, painted in 1873, when she was just in her twenties. It was her second painting ever accepted into the Paris Salon, before she became an impressionist, and one of the very few of her paintings that ever included a man as a subject. And then there were the paintings of women painting. Self-portraits are as old as time, but these self-portraits of women feel daring and fresh. As if there is an urgent message to the world. But again, it is just the story of women asking to be seen. The paintings bear witness to their desires, their struggles, their sheer happiness. Here, for example, is a painting by the Russian Marie Bashkirtseff of herself and other women painters at the Académie Julian in Paris, where she studied from 1877 to 1884. Here is the Swedish artist, Mina Carlson-Bremberg, with an enviable glow of satisfaction. And just take in the look that American Elizabeth Nourse wanted to present to the world. She moved to Paris to study art at the Académie Julian in 1887 and after just three months her teacher told her she required no further instruction. You can see it in her face. But there was one painting I lingered over the longest. It was an ambitious self-portrait that included not only the painter, but also her husband. Anna and Michael Ancher were Danish painters from Skagen, a seaside fishing village that became an art colony in the late 19th century. The painting, a true collaboration by the two of them, shows them sitting quietly in a dark room, critiquing a painting together. We don’t know whose painting it is, but my guess is that it’s Anna’s. She looks the most comfortable; he has perhaps gotten up from his papers and his cup of coffee at the other end of the table to come and join in, to see over Anna’s shoulder exactly what Anna sees. And quietly, collegially, they sit and look. And listen. Anna Ancher is seen and heard, and she knows it. Who knew, that in 2018, such a quiet, virtually unknown painting could convey such a powerfully emotional message? The same goes for all of the paintings in this exhibit. It was an honor to bear witness. Highly recommended: Because there are so many more fabulous paintings to see and stories to be heard, even if it’s not in person. Dimensions: 9 ½ x 11 in. In the second half of the nineteenth century, Paris attracted an international gathering of women artists, drawn to the French capital by its academies and museums, studios and salons. Featuring 37 women from 11 different countries, this sumptuously illustrated book explores the strength of these artists’ creative achievements, through paintings by acclaimed Impressionists such as Mary Cassatt and Berthe Morisot, and exceptional lesser-known artists such as Anna Ancher, Marie Bashkirtseff, Paula Modersohn-Becker, Hanna Pauli, and Lilla Cabot Perry. It examines their work against the sociopolitical background of the period, when women were mostly barred from formal artistic education but skillfully navigated the city’s network of private studio schools, salons, and galleries. Essays consider the powerfully influential work of women Impressionists, representations of the female artist in portraiture, the unique experiences of Nordic women artists, and the significant presence of women artists throughout the history of the Paris Salon. By addressing the long-undervalued contributions of women to the art of the later nineteenth century, Women Artists in Parispays tribute to pioneers who not only created remarkable paintings but also generated momentum toward a more egalitarian art world. This beautiful chateau outside of Paris was once the home of Mary Cassatt, one of America’s greatest painters. Cassatt lived there from 1894 until her death in 1926, and is in fact buried with her family nearby. I first wrote about my visit to this chateau here on this blog in 2014. This beautiful chateau could face demolition as early as December, 2018. In 1961, Cassatt’s niece donated the building and beautiful grounds to Le Moulin Vert, a not-for-profit group for the benefit of local teens. Le Moulin Vert reports that they are not able to afford the expenses associated with the upkeep and improvement of the building, and are exploring sale options. If the property is sold to a developer, the building will most likely be demolished. A group is working to prevent that, but they need help. Les Amis de Mary Cassatt is a small local organization in the area of Le Mesnil Theribus (a northern suburb of Paris) which has been exploring the possibility of preserving the chateau and its grounds, with a long-term goal of using the chateau for art, education and tourism. They have commissioned a preliminary architectural plan and feasibility study. The chateau and property are reportedly on sale for less than $1million USD, but the cost of renovations could be twice that. Imagine if the chateau were saved, renovated and turned into an artists’ retreat and conference center. I can speak on behalf of many women artists who would give their right arm to be able to paint on the same grounds as Mary Cassatt. It could be like Giverny, but devoted to artists and art historians who would like to honor Mary Cassatt’s legacy. In fact, Le Mesnil Theribus would make an excellent stop on an Impressionists Triangle of Greater Paris, including Giverny and Auvers due Oise, which are already tourist sites dedicated to Claude Monet and Vincent Van Gogh. Isn’t it time to add a woman to that list? Time is running out. A group of Americans is trying to help Les Amis de Mary Cassatt by alerting the French government and reaching out to international art lovers who would like to help preserve this beautiful gem. Please let us know with your comments below if you would like to join our urgent efforts. The Other Alcott is a novel I’ve been waiting for for a long time. I’ve known about Louisa May Alcott’s younger sister – the artist, the one after whom the fictional Amy March was created – and I knew the outlines of her story. But that is like the difference between sketching a skeleton and the full, live human figure. In Elise Hooper’s able and generous hands, May’s story is fleshed out. It thrums with life, passion and imagination, and becomes one that we can relate to. It speaks to us across the centuries, a timeless story of one woman artist that can inspire, encourage and guide 21st century women still trying to figure it out today. What else could you possibly ask from historical fiction? I have to admit that even I underestimated May Alcott. When I first saw the illustrations May drew for her sister Louisa’s book Little Women, I agreed with her contemporary critics. The drawings were amateurish, not lifelike enough, the product of an artist not without natural born talent, but still, with a long way to go. The criticism stung. But yet she persisted. May might have been hurt, but she was humble enough to understand that she needed professional instruction. (Lesson #1: Accept valid criticism.) So she figured it out. Elizabeth Jane Gardner as painted by William-Adolphe Bouguereau (her mentor, teacher and future husband) in 1879. I love how little this portrait reveals of her true spirit, except for that hint of a smile. By 1877, May was making her way in the Paris art world. She got a painting accepted into the Paris salon, she met Mary Cassatt, and was seeking a way to earn a living by selling her own original paintings. In the lovely painting below, you can see how far May had come from her early days in Concord. As you can see, Elise Hooper’s book is a lovely story about May Alcott Niericker’s struggle to overcome criticism, sexism, sibling rivalry and family caregiving demands in order to pursue her dream to become a professional artist. It’s chocked full of lessons in both humility and persistence, lessons we still need today. At least I do. The Other Alcott: Highly recommended. I’ve often thought about how my time in Paris, as short as it was, managed to change me. And it seems I can’t stop thinking about the change Paris may have had on other artists, other women, in other times. I’ve taken a look at some of their lives to see if I can spot the power of Paris. American portrait painter Cecilia Beaux (1855-1942), who lived and studied in Paris in 1888-89, makes a great example. Maybe you don’t know much about Cecilia Beaux, but she has some pretty amazing paintings at the Art Institute of Chicago, Metropolitan Museum of New York, or my favorite, Sita and Sarita at Musée d’Orsay. Most people know her, if they know her at all, because William Merritt Chase called her “the greatest woman artist who has ever lived.” I’ve previously written about her struggle to obtain an art education in Philadelphia during the Victorian era. But what interests me the most is her time in Paris. When Beaux took her shot to study in Paris, it seems like it changed her life. She only spent a year and a half there, but when she returned home to the States in 1889 her career really took off. True, she was no slouch before Paris – she’d already studied for over a decade, worked as a professional and received numerous awards. She’d already had a painting accepted in the Paris Salon of 1887. Isn’t the difference stunning? It’s as if she moved from one century to another. And the difference wasn’t just in the vibrant new light in her portraits. As successful as Beaux was before Paris, her output of high profile portraits soared upon her return. She completed over 40 portraits in five years, including some of the most remarkable of her career. By 1895, Beaux was hired to be the first full-time female faculty member of the Pennsylvania Academy of Arts, becoming the Head of Portraits. If Paris did indeed spark Beaux’s success in the 1890s, what was it? The training in the Paris ateliers? The exposure to and networking with other artists? The chance to study from the masters in the Louvre? The experience of freedom as a traveler, an outsider and an expatriate? Or maybe it’s just in the air in Paris. Before I set out to walk in Beaux’s footsteps through Paris I decided to read her autobiography, Background With Figures (1930). I wanted to hear her Paris stories in her own voice and her own words. I was surprised how much I enjoyed the time I spent reading her book – she had a wicked sense of humor and a masterful ability to walk the fine line between truth and discretion. Here was a woman who had seen and achieved a great deal at a time when women of her social background weren’t really supposed to. Beaux is at her best when she tells the story behind her first trip to France. She had long dreamed of studying art in Paris. All the serious American art students were going. But Beaux had an additional, more personal draw: she was half French and was ready to claim her father’s heritage as part of her own. Once her first painting (Les Derniers Jours D’Enfance) was accepted at the Paris Salon of 1887, it seemed as though she’d earned the right to go. But she couldn’t go alone. In spite of the fact that she was 33 years old and had been studying and practicing art for over 17 years, she still wouldn’t travel to Europe without a female companion. Beaux was no rebel; she wouldn’t be breaking the social code that her fine Philadelphia family still observed. Our pension was in the quarter of the Pont de l’Alma, but not near to the river and its beauty. All that a skimping French pension could mean in mid-winter was ours. . . . I had never known the damp, penetrating chill of never-heated houses in winter. . . . Until May, we never saw the sun. Mdlle. de Villeneuve, our keeper, bore her considerable years, which had borne much skimping too, under a brown wig and a long nose. She carried Fi-Fi, a tiny, old dog, with rattling teeth and a cracked bark, constantly under her arm. She had bony fingers, and for the first time I heard the rattle, also, of keys. The visit of our blanchisseuse was one of our pleasures. She had apparently been forgotten in the gathering at the Judgment Seat of the Tricoteuses, left over from the Terror. She was huge, had an immense head with bold pompadour, and a beard. Isn’t Beaux hilarious? Can you imagine how entertaining she was in person? A bit like another one of my favorites, Alice Roosevelt Longworth. Together, Beaux and her cousin investigated the different private art studios open to women (L’´Ecole de Beaux Arts would not accept women for ten more years, in 1897) and chose the Académie Julien’s right bank studio at 28 rue de Faubourg. (This atelier would close at the end of the 1888 season and move to 5 rue de Berri, another address in the aristocratic part of the right bank. Also, I am following Beaux’s spelling here rather than the usual Académie “Julian.”) The Académie Julien was at the time the largest art school in Paris with over 17 locations, 7 of which were devoted to women. Beaux quickly learned that the rue de Faubourg location, housed in an attic near the Madeleine, was more for diletanttes than serious art students. In spite of the relishable novelty of the cours, and the new world I had expected and found, in the Life-Class, I had to sustain a grand déception. More even than on the instruction, I had counted on an association of superiority. I had worked alone, and fully believe that, in Paris, I should be among brilliant and advanced students, far ahead of a practically untaught American. I was to learn that the Académie Julien was a business enterprise, and could not be maintained for gifted students only. The personnel was heterogeneous (pp. 117-18). “The personnel was heterogeneous.” I can just picture Beaux saying that with a wicked little twist of her eyebrow. It turns out Beaux was disappointed with her fellow students’ level of talent, the instructors’ level of input and the overcrowded classrooms. The famous instructors came in to criticize only once a week, and when they did they rarely spent time demonstrating or analyzing the student work. Instead, they would go around the class with comments like pas mal and a reserved smile. Each class was filled to capacity. Punctuality was key or you wouldn’t get an easel close to the model. Beaux gave up the painting class and concentrated on nothing but drawing because she found it too frustrating to try to paint without enough elbow room. To my surprise they were all original types. Later, I accounted for this by the fact that at the time few English women broke away from custom and tradition, Most of them were clergymen’s daughters who had decided against gardening, tea-parties, and the old women of the parish. This had required energy, and also that they should have had a pretty good start already (p. 118). Although there were some “original types” at the rue de Faubourg atelier, Beaux learned that another one of Julien’s ateliers was more competitive. Female students of the atelier at the Passages Panoramas included Russian Marie Bashkirtseff (1858-1884), and Americans Anna Klumpke (1865-1912), Lydia Field Emmet (1866-1952) and Abigail May Alcott Nieriker (1840-1879). Beaux looked forward to competing with her more accomplished peers, but when she did, she received a quick and sobering dose of humility. You can still walk through the Passage des Panoramas in the 2nd arrondissement of Paris, the location of one of Académie Julien’s atelier for women. In March of 1888, two months into her Paris art studies, Beaux realized that she had missed the deadline to submit a painting to the spring Salon. She still hoped for an opportunity to compete at a school show, so she decided to enter a concours against the students in The Passages atelier. Her competition included the Californian Anna Klumpke, who had been studying at The Passages for years and who knew it was faster and easier to pull off a competitive piece in pastel rather than oil. Beaux, on the other, hand, attempted a large oil canvas and in her own words, it was a “nasty failure.” (No images of this painting remain.) Beaux didn’t even receive an honorable mention. For a woman who’d already had a painting accepted in the Paris Salon? Ouch. Beaux knew she needed to do something more in order to benefit from her time in Paris. The Académie Julien wasn’t going to change her life. But what could? Beaux was drawn to visit the Louvre, where she admired the Old Masters and Greek and Roman sculpture. One of her favorite things to do was to visit the drawing gallery early on Saturday mornings, before it opened to the public, and copy from the drawings of Raphael. Like most visiting Americans, Beaux made time to socialize with other Paris artists. Her aunt, Sarah Leavitt Austin, lived in Paris and studied with John Singer Sargent’s teacher, Carolus-Duran. Beaux’s Philadelphia art school friend, Florence Esté, enjoyed a nice little apartment and studio across the street from Luxembourg Gardens, near the heart of the art community on rue Notre Dame des Champs. Esté introduced Beaux to the prominent Philadelphia artists Alexander Harrison and Charles Lasar, both of whom had graduated from L’`Ecole des Beaux-Arts and had settled in Paris. Beaux fully expected to befriend and network with fellow artists Harrison and Lasar. They were all from Philadelphia, they’d each studied at the Pennsylvania Academy of the Arts, and they were all in their mid-30s. They’d all had paintings accepted into the Paris Salon, and were about to exhibit their work together at the Pennsylvania Academy’s Annual Exhibition. The big difference was that Harrison and Lasar had studied at L’`Ecole des Beaux Arts. And of course they were men. Harrison gave Beaux the cold shoulder the first time they met, putting her in the category of all of the other “American girls” who were mere amateurs at art. And then came the summer that changed everything. And it wasn’t it Paris at all. When the Académie Julien closed for the summer, all of the artists of Paris deserted the city for visits to the countryside. Some left for the art colony in Giverny, while others heading south of Paris to the artistic villages near Fontainebleau like Barbizon or Grez. (Read my prior post, Visit an Art Colony in France: Grez-sur-Loing). Beaux’s friend Lucy Scarborough Conant, a fellow American artist, was planning to spend the summer in Brittany with her mother. The Conants invited Beaux and her cousin May to join them in the artistic village of Concarneau. Concarneau then: Alexander Harrison, Haunt of the Artists (no date), Pen and ink. Beaux discovered that the same male artists who had snubbed her in Paris were friendlier in the countryside. Alexander Harrison and Charles (“Shorty”) Lasar were in Concarneau that summer too. Away from the gender politics and good-old boy networks of Philadelphia or Paris, they didn’t mind socializing and painting with women artists. They often went out to paint in plein air as a mixed group. Beaux started turning out lighter, looser canvases, learning to play with rich outdoor color, bigger brushstrokes and bolder cropping. Beaux was now welcome in Harrison and Lasar’s studios, and they began to visit hers as well. They soon became her friends and mentors. It seems that it was right then and there that Cecilia Beaux learned about color and light. That white is never white, and that surfaces absorb and reflect the light around them. That a change in color and light can create your form. Harrison and Lasar began to believe in Beaux and urged her to continue her art studies in Paris if she truly wanted to “clinch it.” Their support was important. Beaux had proven she was no amateur and that she deserved to be taken seriously. Beaux’s summer in Concarneau gave her a taste of the power and joy that can be found within a circle of artists who have mutual respect and admiration. She finally found encouragement, affirmation, criticism and collegiality among her peers. And refreshingly, there is no evidence of any romantic entanglements in the group that could have complicated or compromised their professional relationship. In fact, Beaux rejected the proposal of an American suitor that summer, believing she couldn’t combine her promising career with marriage. Urged on by Harrison and Lasar, Beaux wrote to her uncle and talked him into financing another season of art studies in Paris for the winter of 1889. I believe it was the turning point of her life. And maybe it wasn’t the power of Paris at all, but rather, the the power of a summer outside of Paris. And now, her palette is now in the Archives of American Art at the Smithsonian. I’m thrilled to tell you about a new book featuring The American Girls Art Club in Paris. It’s called The Light of Paris, authored by Eleanor Brown, who also wrote the fun and quirky The Weird Sisters a few years back. Whether you’re a longtime follower of this blog, or you’re interested the history of the Reid Hall in Paris, or maybe you’re just a fellow Francophile, then you’ll love reading about Margie, a young American débutante who defies her family’s traditional expectations to spend a Jazz-Age summer at the American Girls Club in Paris, writing in cafés, meeting avant-garde artists and working at The American Library in Paris. My name is Margie too. How fun is that? It feels a little like reading one of those children’s books that you can have personalized with your child’s name. Margie’s story is told through the lens of her granddaughter Madeleine who finds Margie’s old diaries in a trunk in her mother’s house. The diaries reveal Margie’s secret life in Paris, inspiring Madeleine to rediscover her artistic talents and to pursue her own dreams. The plot might be a bit predictable, but who doesn’t enjoy a story set in Paris? And especially, who wouldn’t love to visit the Left Bank scenes around the Rue de Chevreuse and The American Girls Art Club in Paris? Here is a post I wrote during my own year abroad about the history of the American Girls Art Club in Paris, which includes some of my own photos to accompany the book. I’m posting a few more below. They may not be the best quality, but hey, I was there and it was cool. You get the idea. There are more (and better quality) photos on the Reid Hall – Columbia Global Centers – Paris website. You can watch a video on their website too, which shows some fabulous historical photos and informs you about their current global initiative. Isn’t it good to know that new generations of students and travelers get to have their own adventures in Paris, like those of Margie and other young women of the American Art Club?